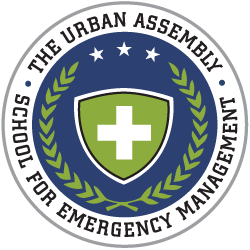 The Urban Assembly School for Emergency Management (UASEM) is a public Career and Technical Education high school that prepares students to engage in complex quantitative and qualitative reasoning skills with an understanding of the principles of Emergency Management. UASEM graduates will be equipped with the skills necessary for entry into the Emergency Management field and for a college of their choice. Our students will engage with internships, collaborative simulations, student-led community training, and strong industry partnerships. We are a continuous learning community invested in understanding our students’ needs for career and college readiness and developing the personal responsibility and empowerment of our students, parents, and staff. The Urban Assembly School for Emergency Management provides students with authentic learning experiences that empower them with the skills to contribute to their communities and succeed in college and career. By constantly applying what they learn in the classroom and industry, students will develop the confidence to pursue their dreams and the character to serve their communities. As a UASEM student, you are R.E.A.D.Y. Resilient: We rebound from academic, personal and professional setbacks by being innovative, actively seeking assistance, and finding new solutions. We remember our strength. Empathetic: We deal with difficult situations as a group. We solve problems through open, constructive communication. We value all opinions and understand that compromise is an essential characteristic to community safety and success. We make sure everyone’s needs are met. Achievement-Oriented: We hold ourselves and each other to high expectations for quality of work and performance. As individuals and groups, we strive for our best, with words, actions, and choices that are always directed toward success. Deliberate: We are purposeful in everything we do, and we understand how our decisions affect ourselves and those around us. We know that questioning and accepting critical feedback are a part of good decision-making. Your Own Ally: We are ultimately responsible for our own success, which means we must take care of ourselves, be both confident and humble, lead by example, and demonstrate exceptional character.